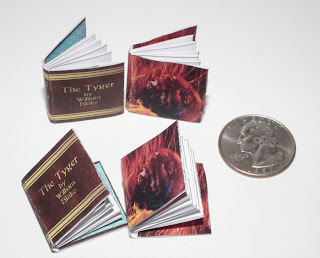 There have been a few requests for more miniature books. I don't do them often, this one is made with a very special young lady in mind who loves poetry, and likes my miniature books. With that in mind, and since I've already done Byron, I chose William Blake's The Tyger. You can find my original miniature book printables here. These are assembled somewhat differently. The original project is all cut and fold. No tape or glue. I've been wanting to try a 1:12 scale accordion book, so it does call for tape. I used transparent tape and a glue roller for this. Masking tape and glue would work just as well, or transparent tape and double stick tape. 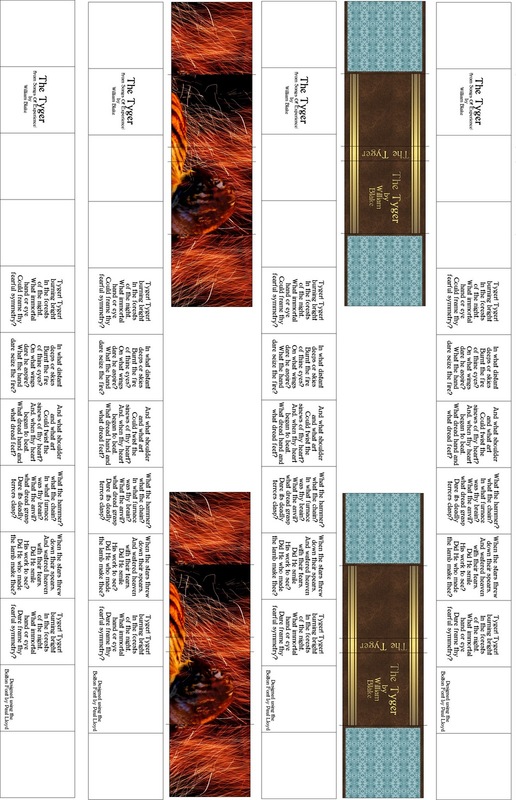 Print the page, it has 4 books on it, so you can make a set for yourself with 2 different covers and a set for a friend, or you could make earrings with them. Cut out the strip of page and the covers on plain paper. I used a semi-glossy paper for mine which is why the edges look a little worn. Score the fold lines. 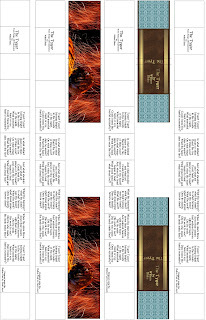 Fold the strip accordion style, back and forth, with the first and last pages pointing up. Now score and fold the cover, and place the book block centered over the spine of the cover. Make sure it's all oriented the right way, so the cover will be on the front of the book with the spine on the left hand side and that the beginning of the book is on the left side and in the same direction as the cover. With the double stick tape, adhere the cover to the book block. Fold the covers over the taped down pages, and use the double stick tape to tape them in place. Fold the book closed, finish the rest of the books the same way, and weight them down under a book until they lie flat. Click on the image for the full sized 300 ppi version. The pages are the same in both versions, using Paul Lloyd's lovely Bolton font. The covers are different. One is a faux leather effect with end papers, the other is a digital collage I made a while back using photos of a bonfire and photos of a tiger that I took at our local zoo. Very nice printie and tut. I will be using this to make some mini books for my doll house!